ASUS today announced Designo MZ27AQ, a stunning 27-inch monitor that heralds a new generation of frameless, ultraslim Designo MZ Series monitors. Winner of a 2017 Computex d&i Award, Designo MZ27AQ features a sharp, WQHD (2560 x 1440) resolution IPS panel with a 100% sRGB color gamut to deliver incredible visuals for home entertainment. Designo MZ27AQ measures just 7mm at its thinnest point and has an integrated 2.1-channel ASUS SonicMaster audio system co-developed with Harman Kardon, which features two 6-watt stereo speakers and an external 5-watt subwoofer. Connectivity options include DisplayPort and two HDMI ports. 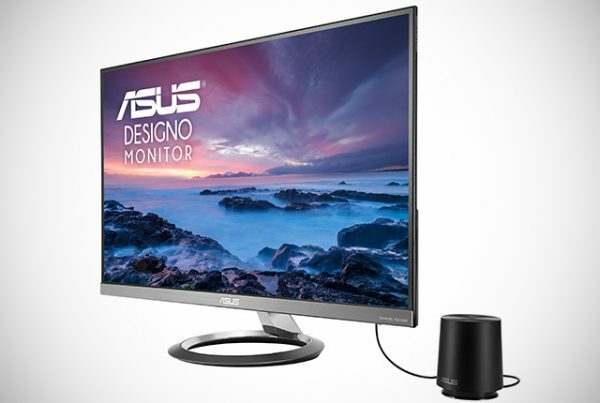 With its WQHD (2560 x 1440) resolution, the 27-inch ASUS Designo MZ27AQ displays 77% more pixels than Full HD monitors, creating a bigger workspace that lets users easily view large documents and websites with less need to scroll or zoom. Designo MZ27AQ’s impressive IPS panel delivers stunning visuals that are excellent for both media editing and home entertainment. A wide 178° viewing angle ensures natural-looking colors with no color shifts, even when viewed from extreme angles. The ultraslim design of ASUS Designo MZ27AQ was recently honored with a 2017 Computex d&i Award. It has a profile that measures just 7mm at its thinnest point, and an edge-to-edge frameless panel that provides a truly immersive and distraction-free viewing experience. This amazingly slim design makes Designo MZ27AQ exceptionally compact and an elegant addition to any home or office. ASUS Designo MZ27AQ incorporates a powerful 2.1-channel ASUS SonicMaster audio system co-developed with Harman Kardon and featuring two 6-watt stereo speakers and an external 5-watt subwoofer to deliver superbly rich, clear and immersive sound. ASUS Designo MZ27AQ incorporates ASUS Eye Care technology with TÜV Rheinland-certified Flicker-Free and Ultra Low Blue Light technologies to minimize eye strain and protect users from harmful blue light. The ASUS Blue Light Filter has four different filter settings that can be accessed via the onscreen display menu, letting users easily control the amount of blue light reduction. ASUS Flicker-Free technology also helps reduce onscreen flicker for a more comfortable viewing experience. Please contact your local ASUS representative for more information.